Polluted runoff is the leading cause for damages to streams, lakes and water supplies in New England. Low-Impact Development techniques and other cost-effective solutions can protect and restore the health of local waters. Town officials, highway departments, conservation commissions, planning boards, lake associations, watershed groups, home builders, engineers and other participants will learn practical guidance to help their communities remove more stormwater pollution for less cost. Learn how to spot and fix problems that are harming your town's water. Click here for registration form and more information! 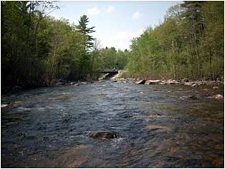 The Massachusetts Watershed Coalition will offer unique training this summer (2013) about simple ways to restore stream life and revive the uses of local streams and lakes. This Stormwater Advocates Training (SWAT) program includes a mix of workshop sessions, guidance materials and fieldwork that will enable participants to reduce polluted runoff. Stormwater from streets, parking areas and other hard surfaces is the leading water quality challenge across the state. One acre of paving produces a million gallons of runoff per year, and this dirty, oily water damages brooks and ponds. Rapid runoff also limits groundwater recharge and lowers stream flows in dry seasons. This runoff is produced by the entire community and everyone can be part of the solution. SWAT participants will attend two workshops and conduct dry and wet weather observations. MWC staff will help participants to select practices to achieve the most pollutant reduction for the least cost. MWC staff will also assist participants to present their findings and recommend stormwater solutions to municipal boards. SWAT training is planned for two locations. Central MA workshops are scheduled for Saturday July 20 (9 am-1pm) and Tuesday July 23 (5-9 pm) at the Broad Meadow Brook Sanctuary in Worcester. Western MA workshops are scheduled for Saturday, August 24 (9 am-1pm) and Thursday August 29 (5-9 pm) in Northampton at a location to be arranged. Registration fee is $40 for workshop sessions, training materials and refreshments. More than 100 people, including municipal officials, engineers, public works staff, homebuilders, contractors and environmental advocates, gathered at Worcester State College on April 12th for the MWC Annual Meeting and Stormwater Solutions conference. Stormwater is produced by the entire community and everyone can remedy runoff. The meeting was an opportunity to share information about runoff remedies that can prevent damages and restore the health of local streams, ponds and water supplies. Curt Spalding, Regional Administrator for EPA's Region 1 Office, made the opening plenary presentation, detailing the challenges of implementing stormwater policies and practices that enhance the "resilience" of local communities. Curt introduced EPA New England's new Soak Up the Rain campaign, which provides educational resources to assist local efforts to infiltrate rainwater--including a new SOTR website that can be found at: http://www.epa.gov/region1/soakuptherain/. The following presentation supplied synergy as Ivan Ussach, MWC's new stormwater campaign coordinator, outlined MWC's new "BGY" Campaign to promote and document reduced stormwater runoff state-wide by 1 Billion Gallons a Year. Ivan displayed a state map showing major watersheds and the results of the BGY's initial inventory to quantify LID projects--over 120 million gallons, and counting!